Expanded design, cumbersome piping problems, additional actuation costs and a large footprint are often the results of individual valves performing redundant individual functions or tasks. By looking beyond yesterday’s selections you could avoid these cumbersome issues in the future. Valves today are easier to adapt and offer additional advantages you could benefit from. One example is Evsco’s modular Stack Valve System. Designs that utilize Stack Valve Systems generally handle comparable flows but reduce the complexity and costs, both upstream and downstream. Stack Valve Systems increase performance by reducing the number of actuators in the system leading to a more efficient compact design. When compared to existing systems, Stack Valves consistently meet and exceed expectations because of these reasons. Stackable designs are compact and flexible. Their versatile design makes them highly configurable to meet sophisticated and diverse requirements. Stack valves can be easily disassembled for service or for adding options and functions. Operation is easy and reliable. Multiple Valves can be operated using one pneumatic or electric actuator. Stack valves are available in flow styles, sizes, with modular conceptual design. All wetted surfaces provide chemical resistance suitable for use with high purity or aggressive chemicals. Innovative valve designs enable a very high flow rate with a small footprint. Industry standard FNPT port connections are available for easy integration into a variety of systems. Evsco valves can be used in a wide variety of applications, including instrumentation, research and development, pilot and process sampling, gas chromatography, inks, P&P, medical, pharm., complex fluid transfer circuitry, remote control and positioning, and switching and transfer systems. Evsco valves have a long history of being able to withstand demanding applications under a wide range of pressure, temperature, and corrosive conditions. Utilizing a wide variety of materials, porting arrangements and sizes, Evsco valves provide you the ability to select the most efficient and appropriate valve, whatever your requirements may be. Engineers and repair workers are always trying to make industrial valves fit their needs – needs their valves were just not intended to meet. In an effort to “meet spec,” design strategies are often driven by constraints, workarounds and tradeoffs resulting in far from “optimal solutions.” OEMs, their customers, nor end users win when they have to settle for less than what is possible and achievable. However, this scenario occurs each time past decisions are repeated without exploring the most current alternatives available. When you have a specific situation that an off-the-shelf valve won’t quite solve, or maybe nothing exists to address the situation at all, consider a customized approach to meet your exact needs. Today, valves could be customized quickly and within budget when you know where to look. The term custom is conceptually understood, but its definition may vary from company to company. EVSCO, for example, offers standard valves in a variety of sizes and configurations, all of which can be modified in numerous ways to meet your needs. With EVSCO’s unique valve design, versatility and variations, their existing line can potentially be modified into a specialty product to meet your for fit, form, and function requirements. A recommendation and quote can be provided in as little as two working days after understanding and analyzing a custom valve’s requirements, application, surroundings, and any other influencing factors. Once approved, the custom valve’s design and flow are tried and tested prior to shipment. A manufacturing design called for limited space with nearby obstructions. The solution was to eliminate a second valve system by using a 4-way valve to obtain identical flow capabilities. This flow pattern may not have been possible with other valves due to their inherent design. But because of EVSCO’s unique construct, space requirements were met without compromising its design. Most manufacturers are not interested in offering specialty or custom valves unless they are guaranteed a high-volume, long-term sale. In this case, EVSCO was able to supply the OEM with a custom valve without a mass quantity commitmentor a horrendous short run cost. EVSCO reacted and responded quickly, shifting focus and finalizing a new design within days. In fact it took EVSCO less than a week to respond with the perfect solution and a fair price. A specialty or custom valve solution will always be a better fix than a compromise or workaround. In many cases a new, highly specialized product can be developed from an existing line of industry proven products to ideally suit stringent applications and requirements. If you’ve settled for good enough in the past because it was the best option at the time, recheck your equipment for opportunities to improve productivity, minimize parts, space and money. You could add value to your company, customers, and end users now that you know where to look! You’re probably already familiar with the benefits of ball valves, but do you know how to get ball valve functionality and customized fluid compatibility without flow restrictions? If not, you’re not alone. When ball valves were initially introduced in the 50’s they were optimized for shutoff applications, frequent on-off service, instantly large flow processes (i.e. safety systems or cooling water systems), and systems where the pressure drop across the valve is expected to remain fairly constant (i.e. steady state systems). In addition to its strengths, ball valves in general share inherent limitations. Across all styles, ball valves have known issues with stem leakage, seat leakage, high pressure recovery, stops not properly set or operators not mounted correctly. In addition, they are difficult to clean, which is why ball valves are not recommended for pharmaceutical, bioprocessing, or food and beverage applications. Because ball valves are basically go, no-go devices, they tend to also be lousy regulators unfit for permanent throttling. And its poor throttling characteristics make ball valves prone to cavitation which is why ball valves are commonly found in flowing systems on ships, fire safe protection services and chlorine manufacturers. Specific ball valve styles have their additional problems. Floating ball valves, for example, encounter issues with high friction and hysteresis. Segmented and trunnion style ball valves suffer from limited differential pressure. While the limitations and constraints of ball valves are well known, alternatives are not. Today, not only are there options, but additional benefits such as more configurable pressure, improved machine control solutions and a consolidation of multiple valve functions into one. EVSCO, for example, offers many different flow solutions to support engineering design. Stack Valves are modular systems that combine multiple control functions into a single assembly. Its improved design offers the flexibility to combine similar or dissimilar flow options with a single actuation. In one assembly you could now combine a broad choice of valves, configurations, actuation, and flow styles. To accommodate the most complex OEM requirement, multiple flow paths with a single, manual, electric or pneumatic actuation are controlled in one operation system. These valves can be configured in parallel, but because they are modular, they allow for any 90 degree port mounting configuration to help eliminate space and ease design. This functionality allows designers to include any combination of the 2-Way, 3-Way, 4-Way, and 5-Way flow paths in one stack valve system operated by one actuator. As a result, a single actuator driving two valves will improve performance and reduce costs. EVSCO Modular Stack Valve Systems offer ball valve functionality, in-line cleaning and servicing, a choice of O-ring materials and inert valve body material. Stack valves eliminate the need to design around constraints, space limitations without flow restrictions and volume. Its unique flow configurations enables the selection of the most appropriate valve for the most efficient system design. Each valve is air-tested under water before shipment for long life and trouble-free operation. While ball valves have their advantages in specific situations, they are not always the optimal choice. So before replacing or specifying your ball valve, evaluate your options. Many alternatives might have been overlooked in the past or available but unknown. There are also many new entrants that were not previously in existence that could be the optimal valve for you. Applications often require multiple actuated valves to run in series, which tags on the added baggage of complicated designs and higher costs. With applications that run valves in sequence or multiple actuated valves, each individual valve needs its own actuation. Purchasing several electric or pneumatic actuated units can significantly bump up costs, not to mention the cumbersome planning involved with creating the design footprint. Luckily, a solution exists for OEMs to avoid these added expenses and simplify their design. 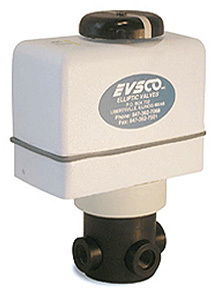 The “Stack Valve,” part of EVSCO’s Elliptomatic series, has the capabilities of operating multiple valves with a single actuator. ‘Elliptomatic’ refers to the valve’s technology with simple design and added flow patterns. An innovated system proven to work, pneumatic and electric actuated valves also compact, designed to make installation easy for engineers. Operate multiple valves at once. The Stack Valve functions and tests very similarly to actuated ball valves … only with the added benefit of one-actuation operation. While traditional valve systems work with one actuator, the stack design performs perfectly with just a single actuator to set off multiple valves. OEMs and engineers now have an easier time managing applications and can avoid the bulk of adding multiple actuations within the application. The stack valve furthermore eliminates the need to purchase additional electric or pneumatic actuators, making it a cost-effective choice. The simplified design of EVSCO’s Elliptomatic Series broadens its range of compatibility to fit diverse design footprints for endless applications. The compact, rugged structure of the valve makes it ideal for accommodating space limitations, giving engineers maximum flexibility without having to concern over the systems durability. In terms of flow patterns, the elliptic stack valves offer a modular design with vast directional capabilities to support OEM’s in an effort to break free of restrictive old-school flow solutions. To help with your next flow pattern selection for your OEM design, check out the Elliptic Valve flow possibilities here: http://www.evsco.com/flow-patterns.html. Made of polypropylene or PVDF, well-built FDA grade materials. The actuated elliptic valves systems are well built to withstand hostile, corrosive environments. Including coated pneumatic and electric actuators to insure your processes is high performance. Elliptic valves inherently have a self-contained wiping and cleaning feature to maintain the integrity of the design, further extending each part’s longevity and lifetime performance. The patented structure decelerates natural build-up in the valve body, with full ports to allow for constant flow in areas as tough as pulp and paper process. By selecting an accompanying elliptic valve O-ring made of materials matching your application, the fluids flowing through will assure compatibility, further prolonging each stack valve’s high level of functionality. The Elliptomatic series of actuators are offered in AC or DC voltages, with the choice of Pneumatic Air to Air or Air to Spring (fail safe). Combined with the flexibility of flow solutions capable in a much smaller area, the stack valve provides the perfect solution to simplify designs and save on actuator costs. For more information on the stack valve, visit http://plastic-valves.evsco.com/category/stack-valves-3. Engineers may disregard some, if not all, of these factors that affect not only efficiency and longevity of the individual part but the entire application’s level of performance. We examine how Polypropylene and PVDF valves rate in each of these category, detailing how these durable selections can lead to lower costs of total ownership and higher levels of lifetime functionality. In addition to handling anti-corrosion in typical temperatures and flow patterns, Polypropylene and PVDF valves, the standard inert materials used in Evsco’s valves and construction, can also withstand explosion proof rating actuation. The non-toxic FDA grade materials make them safe and suitable for chemical applications. Evsco also offers solutions that combine the valves with selected O-rings to suit custom designs. *As a word of caution, not all PVDF is created equal. Evsco’s line of products conform with FDA grade ratings, the highest awarded, which allows its applications to take on aggressive services as well as higher purity choices. Maintaining a seal on chemical applications is an absolute MUST, and the tighter the seal the better. The proper O-Ring will ensure full security from leaks that could significantly setback flow patterns. Manufacturers like Evsco offer choices for O-Rings, even custom designs to match particular applications. An Interchangeable O-Ring functions best with a correct fitting to wetted PVDF or Polypropylene base valves. The combination guarantees service compatibility that customers will notice. When it comes to flow, the broader the range of possible patterns, the easier the Engineer can manage design criteria for various or multiple applications. The more precise patterns allotted, the more likely a configuration will exist that is appropriate for the exact combinations of chemicals in the process. Evsco offers many, if not the most, diverse flow patterns in the industry. If the application requires sequential actuated valves to run simultaneously in a system, reach for a ball-valve alternative. Evsco offers a Stack Valve system which makes it possible to operate two or more valves with one actuator to drive the lowest base actuation costs in the market. The Polypropylene or PVDF material maintains a consistent flow even in the stacked setup for multi-directional applications. Also consider electric or pneumatic actuators, which may serve best under varied types of continuous process conditions. No matter how durable or functional the process, OEM’s must also consider the serviceability of the application. What is the downtime like for quick fixes and interruptions? Are the valves and other parts easily accessible in the application? Quick and easy operational maintenance stems from a smart, simple design and results in optimum performance and long service life. Valves made with Polypropylene or PVDF from Evsco’s line of products possess a compact design for easy placement and removal. In-Line service features allow for extensions on designs to better suit the applications needs. Factoring in all four of these considerations during the design phase, the Polypropylene or PVDF valves prove strong candidates for chemical applications that service harsh or erosive chemicals, unique flow patterns, or require durability and easy maintenance. A simple choice of the right product from the start can lead to the most reliable performance over the course of the application’s lifetime. The introduction of actuated stack valves has revolutionized the capabilities of traditional ball valves. Along with better design and simplified operation, these nonstandard units also accommodate complex applications to overcome old-school flow solution limits. This alternative ball valve looks exactly as it sounds: valves placed atop one another. A simple concept, yet the ability to incorporate multi-directional flow patterns with a single unit leads to more flexibility and more cost savings. What makes these 2-high, 2-4 position, 2 or 3-way stack valves unique are their ability to operate simultaneously with just one actuator. The simpler 2-position 2-stack ball valves and more complex 4-position 3-way manual valves work alike with a singular release capability. Manual valves traditionally only worked with one actuator per in-out point. But the new design allows multiple flow solutions to occur simultaneously through a single operation. More cross-functional flow patterns can be executed from one place, leading to simplified monitoring and execution. Though designed vertically, stack valves still maintain the standardized dimensions and therefore functionality of traditional valves, only allowing for multilayered flow patterns. Individual units can be used singularly or stacked further to create more complex patterns. This opens the opportunities to manipulate flow patterns to better fulfill the application’s needs. The ability to stack valves vertically also saves tremendous space on the overall landscape. With fewer valves side by side, this lessens the change for leaks and misalignment. When repairs do need to take place, only one valve rather then several in a row must be exchanged, and again the 1-actuator system prevents such restorations from halting the entire application. Actuated stack valves really work to simplify applications by offering a more flexible design for multiple flow patterns that can still operate under just one actuator. Better design and functionality result in fewer problems and greater cost savings. This entry was posted in Uncategorized and tagged 4 Position Valves, Actuated Stack Valves, Ball Valves, Multi Cross-Flow Solutions on June 18, 2013 by admin.